Researchers have shown how to create morphing robotic mechanisms and shape-shifting sculptures from a single sheet of paper in a method reminiscent of origami, the Japanese art of paper folding. The new method, called Kaleidogami, uses computational algorithms and tools to create precisely folded structures. "The approach represents new geometric algorithms and methods to create works of kinetic, or moving, art," said Karthik Ramani, Purdue University's Donald W. Feddersen Professor of Mechanical Engineering. "Scientists and engineers are often motivated by the beauty of artistic representations while artists and architectural designers want to harness concepts from science, technology, engineering and mathematics. One of our aims is to provide a new geometry-inspired art form, reconfigurable structures, in the emerging field of kinetic art." Whereas Kaleidogami focuses on artistic representations of sculptural structures, the researchers also have created a variation called Kinetogami to create foldable robot-like mechanisms. They envision robots that can "reconfigure" themselves to suit the terrain, morphing from a slithering inchworm motion to a six-legged walking gait. "Our hexapod robotic mechanism can adjust its body frequently in an adaptive manner to provide a wide range of gaits: lying down, flipping itself up, rising, squatting, squirming and crawling," said mechanical engineering doctoral student Wei Gao. "The folded designs have an elegant simplicity, while using paper and cardboard-like materials that are flat is practical because they are very inexpensive and lightweight." 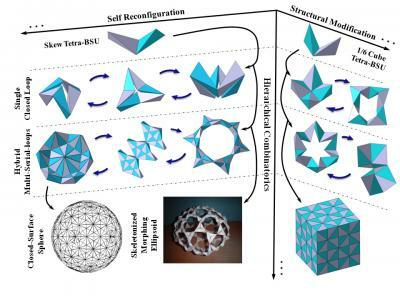 Findings about the concept are detailed in a research paper being presented during the Shape Modeling International 2012 conference on May 22-25 in College Station, Texas. Other findings specifically about the robotlike mechanisms with Kinetogami will be presented during the American Society of Mechanical Engineers International Design Engineering Technical Conferences on Aug. 12-15 in Chicago. The method also could be used in architecture to design features including vaulted ceilings, skylights and retractable roofs. The researchers have created paper models of the designs and are looking into using a variety of systems to power the structures. "This is a proof of concept," said Raymond Cipra, a professor of mechanical engineering and a co-author of the second research paper. The robotic and artistic designs are made up of building blocks called "basic structural units," or BSUs. Each BSU contains two segments joined by a creased hinge, and many BSUs are linked together to create larger structures. "Whereas traditional origami allows only folding, we create our structures by folding and also making cuts to a single piece of flat paperlike materials," Gao said. Such robots, toys and artwork would be ideal for shipping because they could be transported as a flat sheet and later changed into their three-dimensional structures. "It also gives rise to a lot of interesting educational applications," Gao said. "For example, you can help students learn 3-D geometry, study mechanics and test load carrying capacity and stiffness while at the same time having fun." The researchers plan to explore collaborations with museums to incorporate kinetic art in exhibits.